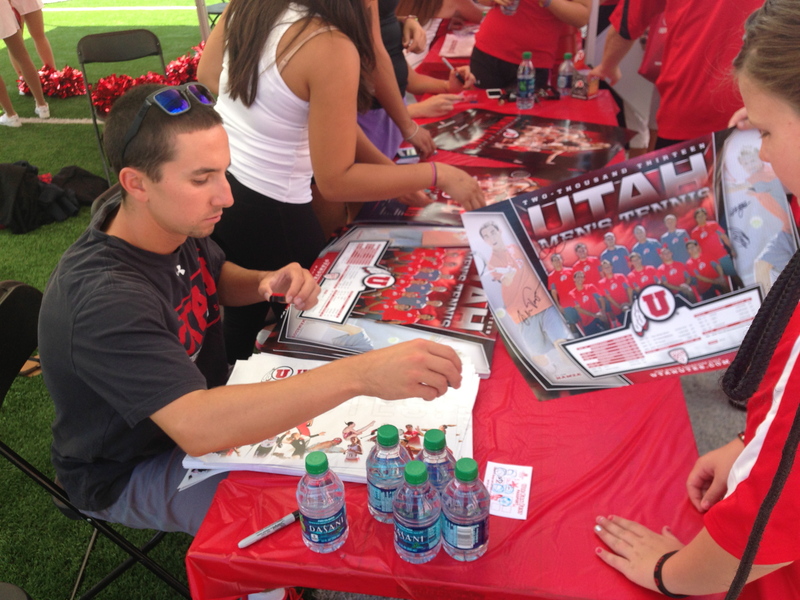 SALT LAKE CITY – The annual Ute Fan Fest will be held on Saturday, Aug. 23 from 6-9 p.m. at Rice-Eccles Stadium. The event is free to the public and will feature representatives from all 18 Utah varsity teams. The men’s and women’s tennis teams will be there with a quickstart tennis court to hit balls with young fans. A fireworks display to conclude the night is a new addition to the Fan Fest with the move from afternoon to evening, as well as lighting the U. There will also be performances from band and cheer, with a Red Thunder drum performance new for this year. Interactive games, face painting and photos with U. student-athletes are among the popular events returning. Freshman football players will be on hand to mingle with fans midway through the event. The bookstore will have a store on the south plaza that will feature the new U Athletics Apparel line and Ute Proud shirts, and the ticket office will be open for single-game football ticket sales. ESPN 700 and Bill Riley will be broadcasting live from the plaza. Concession stands will be open with food available for purchase. Fans may park in the west parking lot and should enter through gates A and B on the southwest side of the stadium. This entry was posted in Uncategorized and tagged Fan Fest, Go Utes!, Utah Utes. Bookmark the permalink.